Anyway, it’s another BBC Good Food recipe. It takes a little while, but it’s easy. Plus it’s worth the wait. Oh, so worth the wait. Quarter to half fill a saucepan with water and put it on to boil. 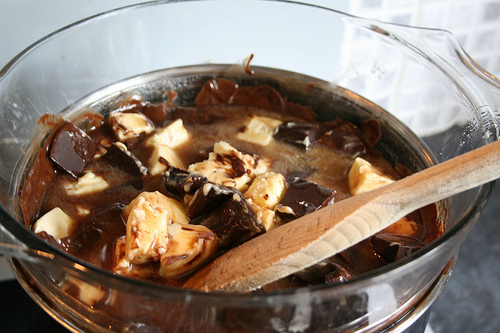 Put a deep dish on top of this and start adding the butter, cut into small cubes, to it. 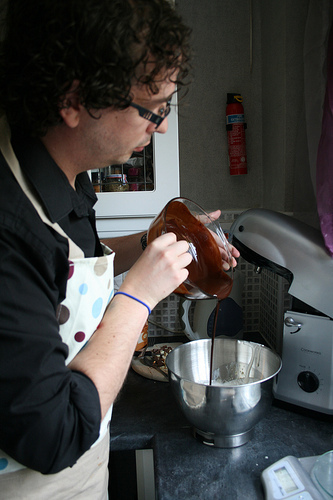 Then break up the dark chocolate and add that to the dish too. Stir it until it’s all fully melted and mixed, then take the dish off the pan and set it aside to cool. It’s very important to take the dish off the pan because otherwise the chocolate will go all disgusting and lumpy, like mud. 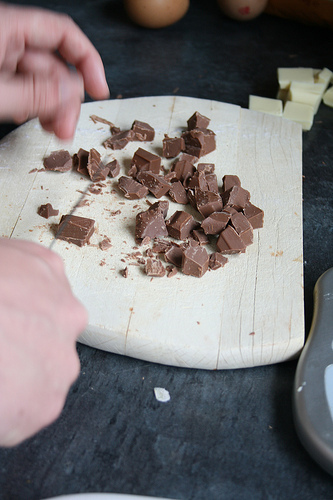 It’s easiest to do it if you leave the chocolate in the whole bar and chop it diagonally and then cut those diagonal strips into smaller chunks. Put the chocolate on the board and bring the knife down on top pushing down forcefully to break it — that way you end up with significantly less chopped off fingers. Break the eggs in a bowl and beat them lightly. The pour in the sugar and whisk with an electric whisk for about 6-8 minutes, until it’s lovely and thick and creamy and pale like a McDonalds milkshake. 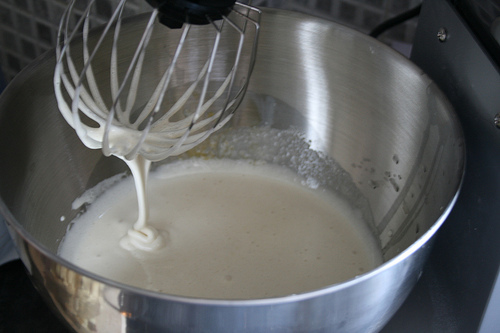 Ideally it should be able to support its own weight — if you take the whisk out and trail it over the surface of the mix, the trail should rest on the top for a while. 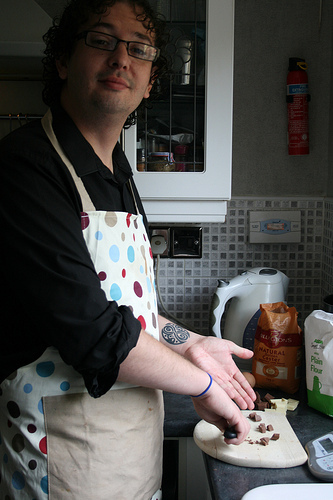 …and mix it in either with a wooden spoon or a rubber spatula. It says on the recipe that a rubber spatula is better, no idea why this should be but if BBC Good Food says it I’m going to go along with them and their never ending genius. 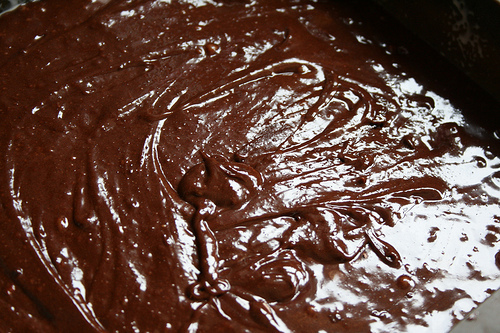 You need to fold it in — make a figure of 8 in the mix, going as deep to the bottom as possible because the chocolate will sink and you want your brownies to be all chocolately all over! But be gentle to keep the texture nice. 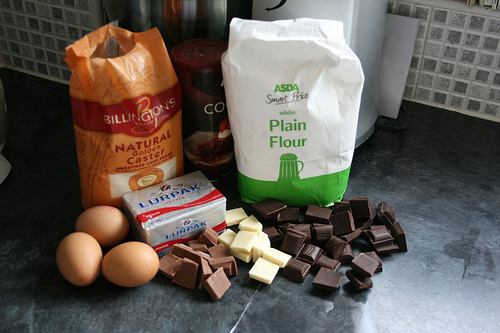 Sieve the cocoa powder and flour into the chocolate and egg mix and again, fold it in very, very gently. When it seems like it’s almost mixed in, stop. 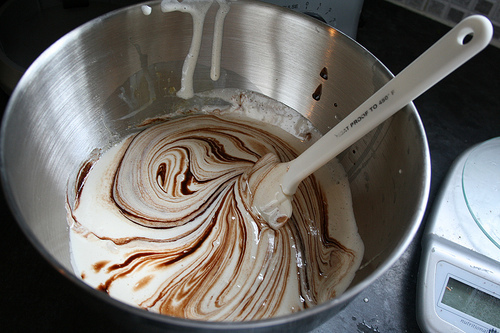 Then add the white and milk chocolate chunks, and stir for a few seconds more. Then pour the mix into your greased tin and stick it in your pre-heated oven. It should bake for about 20-25 minutes. Shake the tin and if the middle wobbles, it’s not quite ready. When it’s ready, take it out and leave it to cool. When it’s cool cut it into however many pieces you want, and voila. Oh, they were so good. They taste better the day after they are cooked. But they taste flipping lovely the day that they are made. 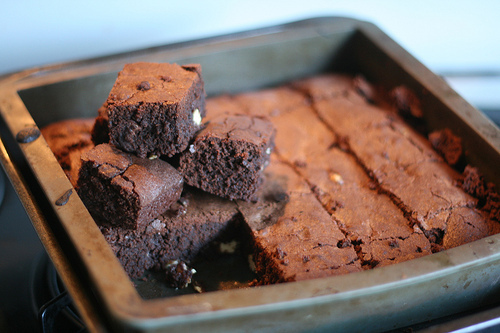 I packaged these up and sent them down to London and they were described as the “nicest brownies”. Which is a good description, I must say. There are photos of these up in a Flickr photoset and please, please make them. They are worth it.